Many people aren't aware that oral cancer causes one American death every hour and has for 40 years. While other cancers are decreasing, oral cancer is still on the rise, up a projected 11% over last year. More than 30,000 people will be diagnosed this year, but only 57% will live more than 5 years. The key to survival is early diagnosis. In many cases, oral cancer is diagnosed when white lesions appear on the soft tissues in the mouth. By the time we can see these spots, it may be too late to save the patient. Recent advances have produced diagnostic tools that detect oral cancer before the lesions are visible to the naked eye, increasing the cure rate to greater than 80%! 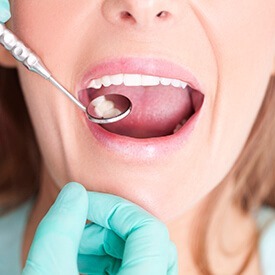 As our patient, you will receive an oral cancer assessment at each checkup. We use ViziLite Plus with TBlue 630, a safe, convenient, and effective diagnostic and marking system. You will simply rinse with a special solution, then we'll examine your mouth's soft tissues with the help of a low-energy light. The solution makes underlying oral cancer cells visible as white patches. We mark the white patches with TBlue 360, a safe dye that will show us where the suspect areas are after we remove the low-energy light. 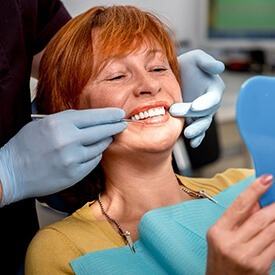 We will then take intraoral photographs to keep on file and send to your dental or medical insurance carrier. Take the online oral cancer risk assessment here!